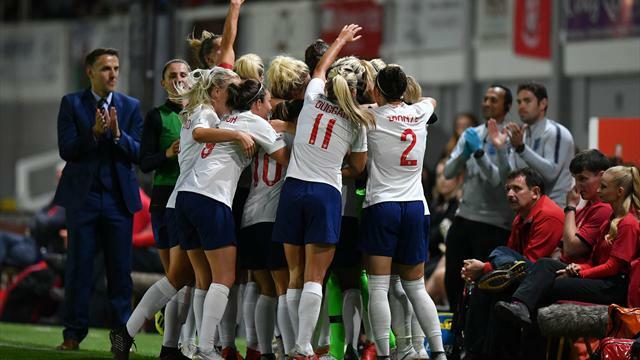 England and Scotland have been drawn together in the 2019 Women's World Cup which takes place next summer in France. The pair are joined by 2011 World Cup winners, Japan, and Argentina in Group D.
Having recorded their best World Cup finish of third in 2015, Phil Neville's England may find it challenging to repeat that feat after being drawn with 2015 runners-up Japan, who knocked the Lionesses out at the semi-final stage in Canada. Scotland will be relishing the opportunity to take on England in their first appearance at a World Cup finals. That looks the toughest group, bringing a wry smile from draw conductor and former England defender Alex Scott alongside former Manchester United and France striker Louis Saha in Paris' Seine Musical venue. "I know Phil Neville is here tonight and I'm sure he'll be telling his players 'bronze medal is good, but it's about turning that bronze medal into a gold one'. You want to make sure you're on the podium," Scott told the packed auditorium including coaches and players from all 24 participating nations. The finals take place from 7 June to 7 July in 2019, with the final set to take place at the Stade de Lyon. Jill Ellis' U.S. side, who beat Japan 5-2 in the final to win the World Cup in Canada three years ago, were drawn with Thailand, debutants Chile and 2016 Olympic silver medallists Sweden in Group F.
Hosts France, who have never gone past the semi-finals, will also face 1995 champions Norway and Nigeria in Group A of the eighth edition of the tournament. Germany, the only country besides Norway, the U.S. and Japan to win the World Cup, face a resurgent China in their Group B opener before taking on Spain and South Africa. Group C sees Australia face Brazil, once again spearheaded by former player of the year Marta, along with Italy and tournament debutants Jamaica. European champions the Netherlands may have high hopes of reaching the latter stages from Group E but will have to get the better of Canada, Cameroon and New Zealand.